Who's that with the gorgeously ghoulish toothy grin? Why it's Gumball Jelly Shot, of course! Happy Halloween-ish weekend everyone! 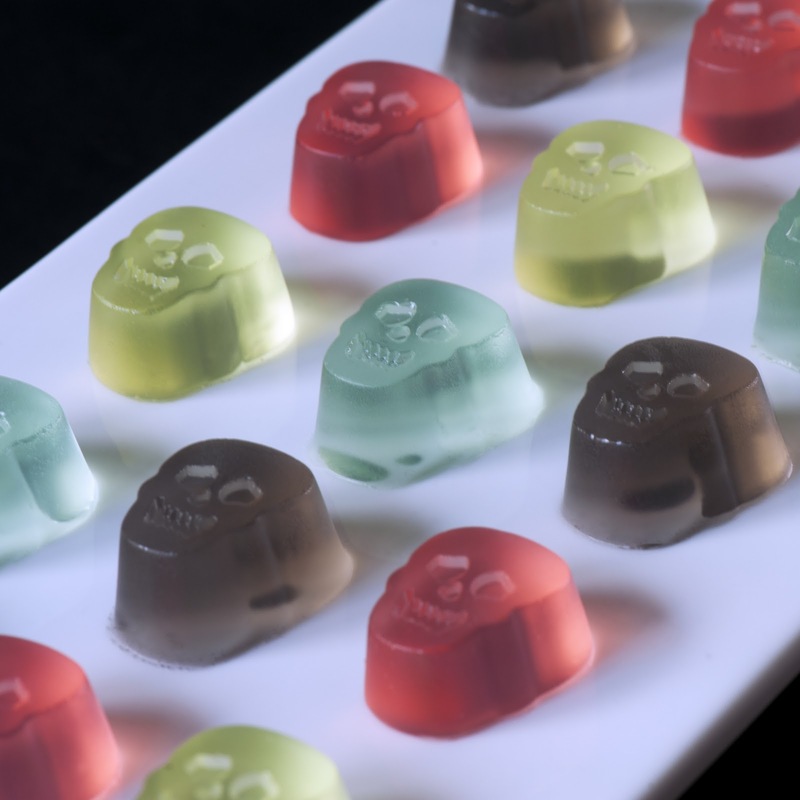 I'm celebrating with a candy-themed jelly shot and a cheery little skull mold. Actually, its a silicone ice cube tray - here's the link - manufacturer is Wilton, and it was stocked at my local craft store (and probably is at yours too!). Link here. . . The recipe was initially for a Black Gumball Jelly Shot, based on bubblegum vodka a touch of black Sambuca liqueur. During testing, it came to my attention that a black gumball is a love-it-or-hate-it affair. So I experimented with other liqueurs - various "pucker" flavors, and a cinnamon. The recipe worked beautifully, and its fun to have lots of different colors of gumballs, don't you think? The only caveat is to use a light hand with the liqueurs - you don't want to lose the delicate, Bazooka Joe flavor of the bubble gum vodka! Pour the soda into a saucepan and sprinkle with the gelatin. Allow to soak for a minute or two. Heat over low heat, stirring constantly, until gelatin is dissolved (about 5 minutes). To serve, unmold, loosen the edges by pulling away from the side of the mold, and just pop each jelly shot out.